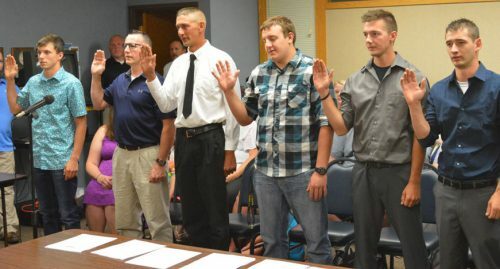 SYRACUSE — The Syracuse Town Council started its regular monthly meeting Tuesday night, Aug. 15, with Town Attorney Vern Landis swearing in six new Syracuse Reserve Officers. The new officers are Cody Leer, Jonathan Fannin, Matthew Eckand, Terrence Wire, Joseph Taylor and Joshua Gohlke. A seventh reserve officer, Ryan Emery, was sworn in at an earlier date. These new reserve officers bring the reserve force up to nine officers. The town is allowed to have 10 by state statue. Town Manager Henry DeJulia told the council annexation of the technology park is now complete. The next step will be rezoning since zoning regulations between Elkhart and Kosciusko Counties are not compatible. DeJulia will recommend the park be zoned light industrial. Along with the new zoning, a new Tax Increment Finance District will be created just for the park. DeJulia also reported he is hiring a utility attorney who specializes in contracts to look over the dispute between the town and the Turkey Creek Sewer District. The attorney will cost $5,000. DeJulia hopes to meet with the sewer district representatives in about three weeks after the attorney reviews the situation. Council president Tom Hoover agreed this was the route the situation needs to go in. In the park department report, Chad Jonsson, park superintendent, reported the kids Olympics will be held Aug. 26. Today, Wednesday, Aug. 16, is the last day life guards will be on duty at Lakeside Park. As the park board continues work on its 5-year master plan a community survey will be sent out for community input. Fire Chief Mickey Scott reported the Turkey Creek Fire Territory has used 41 percent of its budget with 58 percent of the year over. Scott thanked the town council, fire territory board and township advisory board for working together on the fire territory budget. The fire territory is working on architectural drawings for improvements to Fire Stations I and II. The fire territory is also working with the Wawasee School Corporation at the new elementary school so it will be “as safe as it can be,” he said. The fire department is putting up knock boxes at local businesses and summer homes. These allow fire fighters access if no one is around and there is an alarm, it also allows fire fighters to lock up after themselves as well. The boxes also provide the fire department with contact information in case there’s a problem. Paula Kehr-Wicker, clerk-treasurer, asked if there were any questions regarding the budgets. She also touched on a new law regarding Motor Vehicle Highway money. The state has not provided any assistance regarding questions clerk-treasurers have regarding changes to the law. So what Kehr-Wicker suggested is the town create another department in the account, one of allocated fund and the second for unallocated funds. It will provide more paperwork, but also provide a clear paper trail for appropriations. Scott reminded everyone to be careful on Thursday as students will be reporting back to school. He also reminded drivers to stop for buses when the stop arm is out, even emergency vehicles have to stop for school buses. Sharon Fowler asked if an ambulance with a patient has to stop for a school bus with as stop arm out. Scott said yes, it was state law and anything that happens in the first 30 minutes at the emergency room can be done in the back of an ambulance. There was no public works report from Robin Merchant, public works superintendent. DeJulia also told the council there will be a public meeting sometime in the fall regarding a round-about at SR 13 and US 6.